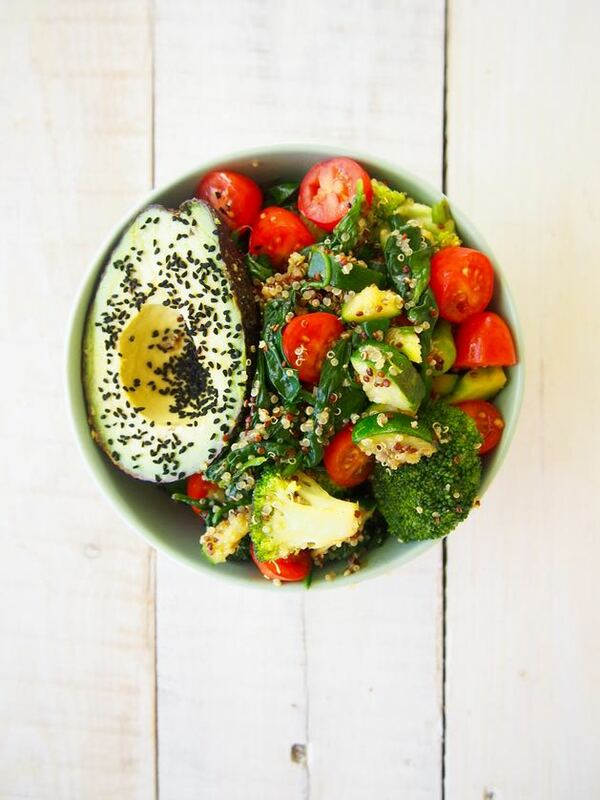 Have you noticed that everything looks better and tastes better when you serve it in bowls? We might have made this fact up… but we sure know that whenever we post a merrymaker lunch bowl it gets double the likes than lunch plates. Weird, but true! There is some kinda bowl craze going on. Anyway lets talk about this delicious Merrymaker bowl recipe. It’s too good, too real, too yum. We just mixed up all our ingredients into a one big Merry rainbow bowl. But maybe next time we’ll separate everything… because that looks COOL! 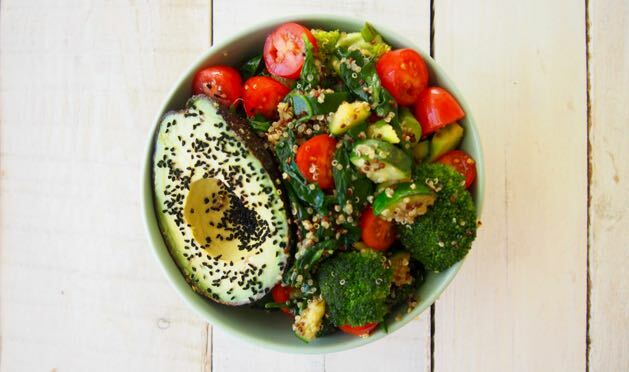 Our Merrymaker Bowl is mostly green veggies, then we added a little quinoa for some healthy carbs, tomatoes and AVOCADO… because avo makes everything better! You can swap the ingredients to your favourites. Not a fan of avocado? Well first off, you’re bonkers (avo is the best invention) but you can swap to roast pumpkin, sweet potato or beetroot or whatever your tummy desires! Follow your gut (hehe). 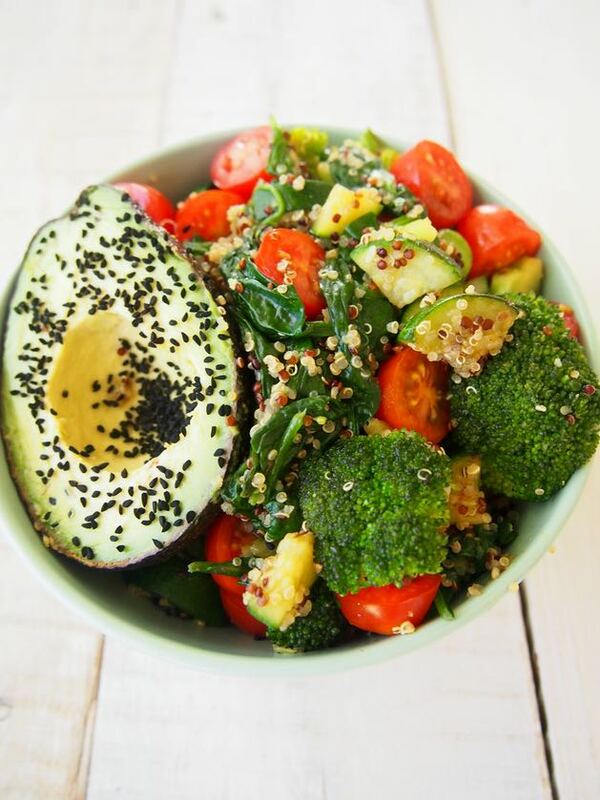 And then you could even add some chicken or boiled eggs and leave out the quinoa completely! This Merrymaker Bowl is officially the best best way to use up any leftovers! In a saucepan place the quinoa along with 1/2 cup water. Bring to the boil, then turn down the heat, cover and simmer for 10 minutes. Once the quinoa is cooked, drain and rinse well. Meanwhile, in a fry pan on high heat melt the coconut oil and add the shallots. Add the broccoli, zucchini and turmeric, fry for 5 minutes or until the broccoli is cooked to your liking (we like it crunchy!). Add the tomatoes, spinach and cooked quinoa, continue to fry until the spinach is just wilted. Serve out (in bowls!) and season with salt, pepper and some nigella seeds if you like! Change up the ingredients! You can put ANYTHING in your merrymaker bowl! 🙂 Yum!